What do analogies have to do with science? Well, to answer that we need to look at what learning is. Boiled down to its basic premise, learning is making connections between what we already know and a new experience. Our brains—and the brains of our children—are designed to make sense of new material by wiring and rewiring nerve pathways that encode memory and understanding. With science it is often assumed that memorizing science facts is equivalent to learning science. But that is simply not true. Merely reading about new concepts is not only boring, but does very little for the neural pathway wiring process. Learning science should be an active process. Doing science is always best, but for those times when doing science is impractical or will have to wait until co-op day, employing active reading strategies will make those new neural pathways happen. This is where analogies can help, since analogies use a familiar concept to help explain a new one. Using analogies in science is a great way to help kids make those connections between what they already know and the new material they’re reading about. It may take a little practice to find analogies you can use with your children, but it will be well worth it. You can find examples of analogies everywhere. 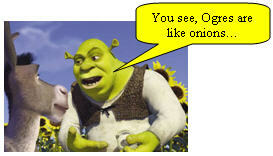 The video snippet below shows Shrek using an analogy to describe ogres. And you can find more like this in just about every movie or TV show out there. In fact, scientists use analogies a lot to explain and describe phenomenon that are sometimes hard to understand. Watch this short clip of a documentary about weaver ants and see how many analogies you can find in the description. I like to have students write short, illustrated stories using the analogies above as a way to assess their understanding. It’s also a great idea to have older children explain the new concepts using their illustrated story analogies to younger siblings. These types of active learning exercises reinforce the encoding of new information into memory. It is important, though, to point out the places where any analogy breaks down. While analogies help students make connections, dissimilar features of an analogy will cause students to develop the wrong connections. Science learning builds on itself, so having a good foundation without misconceptions will make more advanced learning easier at a later date.